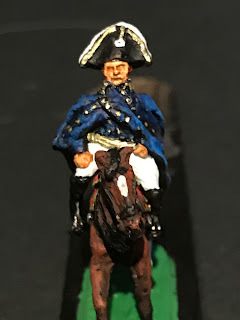 Now Recruiting - Do you have any Hinton Hunt Figures You No Longer Want? 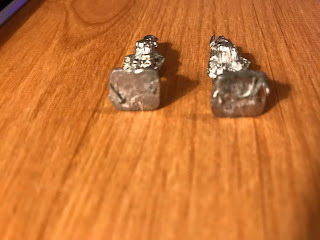 Hi, if you would like to contact me, just leave a comment with your e-mail address. 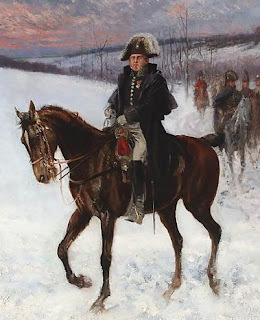 if you don't want me to publish it, just let me know. Thank you all for visiting my blog over the last few years. I hope to post again in the not to distant future. 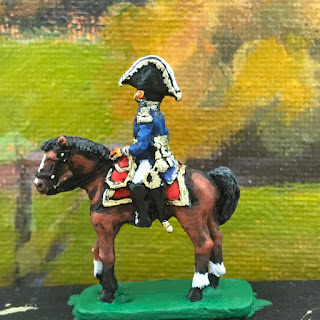 General Gilbert Désiré Joseph Bachelu has been repainted and now has a new uniform and horse. His face looks a bit odd in this photo; it looks somewhat different (better) in person. 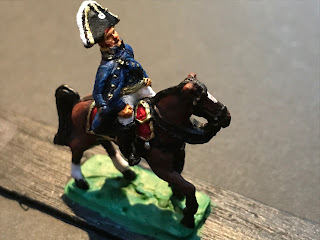 All in all., I am happy at how he turned out. 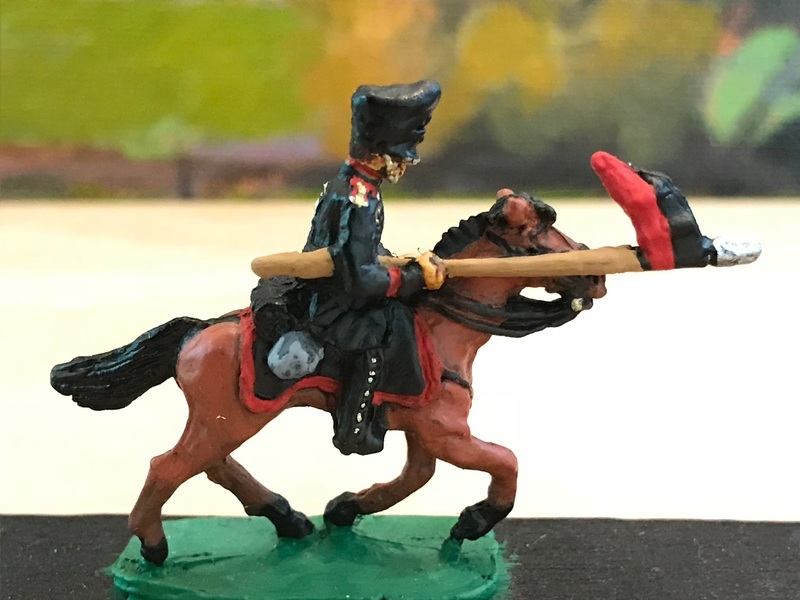 He has not had his gloss applied yet. 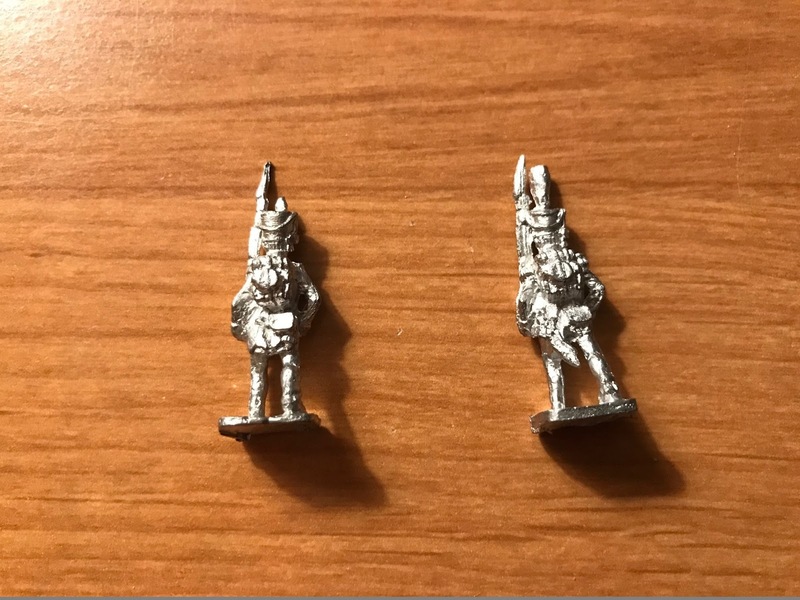 The entire army will be glossified at a later date. As always, please leave your comments below. 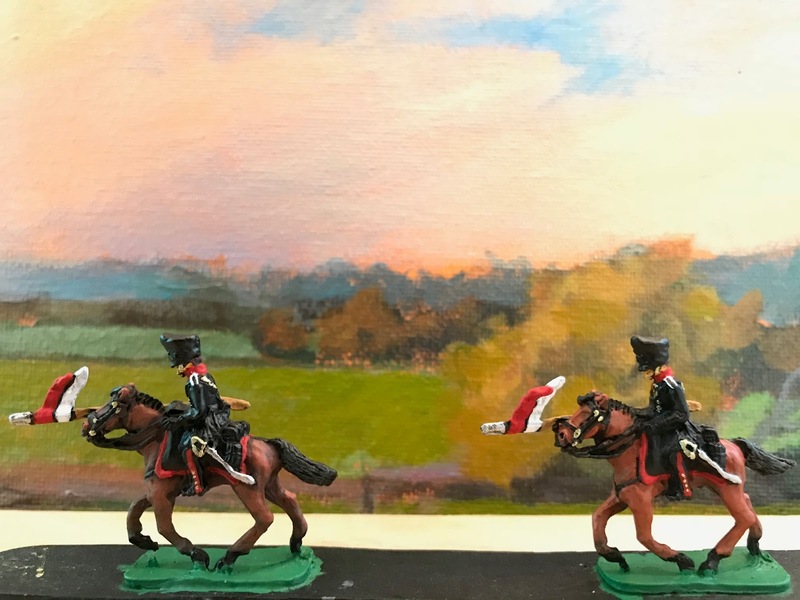 as the sun raises over the Wurmberg in Bremen. This unit was formed out of Uhlans from Lutzow's Freikorps and Uhlans from the Bremen Volunteers. 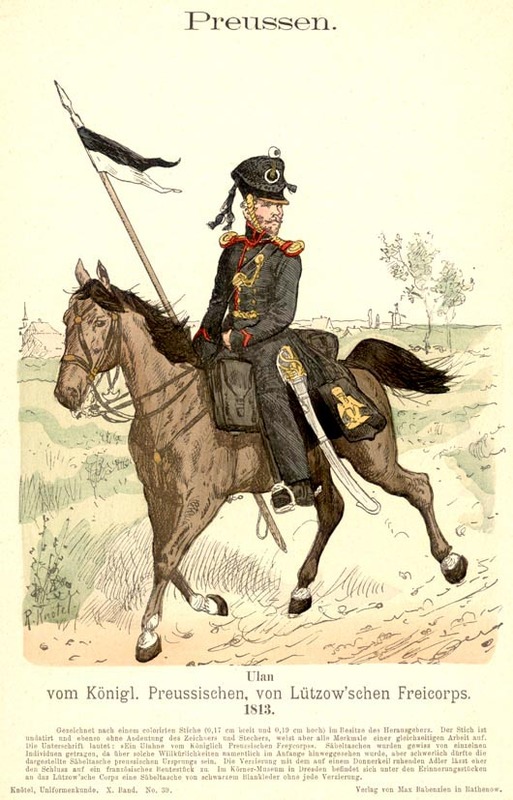 Note the different colored pennons on the lances and the slightly different uniforms. 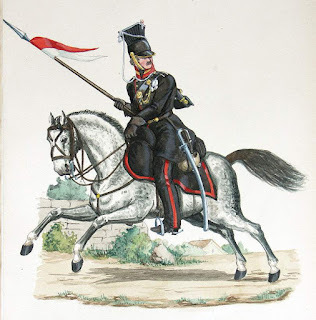 There are some small differences between the Lutzow's Freikorps uniform/equipment (black collars piped in red, red shoulder straps and gold scales, and black over red lance pennons) and those of the Bremen Volunteers (red collars, white piping on the shoulder strap, and red over white pennons). Bremen Volunteers (red collars, white piping on the shoulder strap, and red over white pennons). 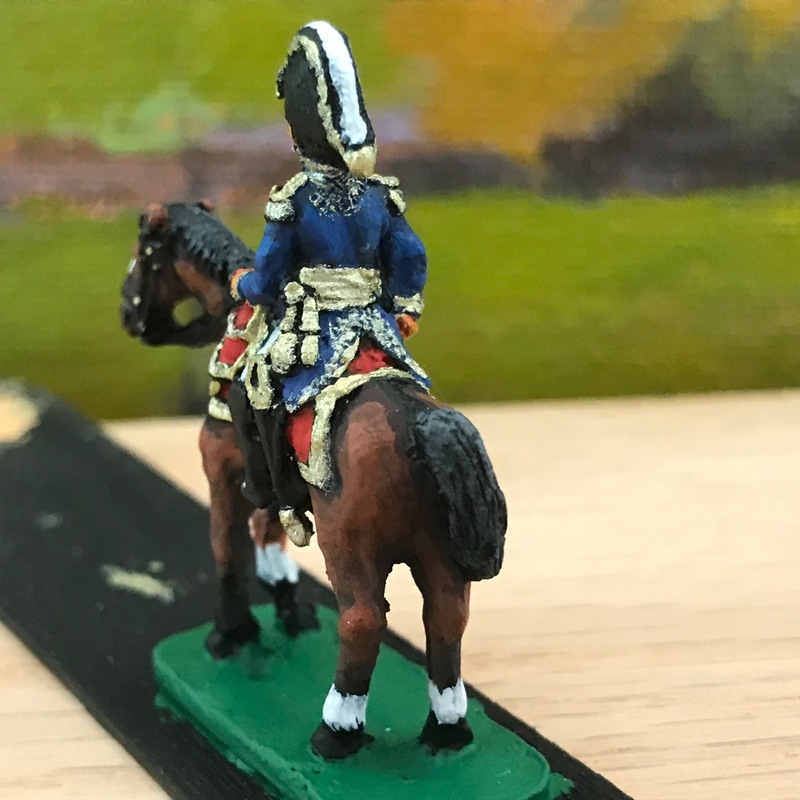 Note the buttons on the trousers in above plate are not visible. 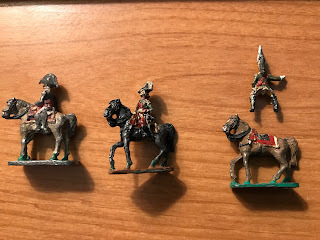 They are on the figures, so I added them. Bremen Volunteers in reverse (red collars, white piping on the shoulder strap, and red over white pennons). 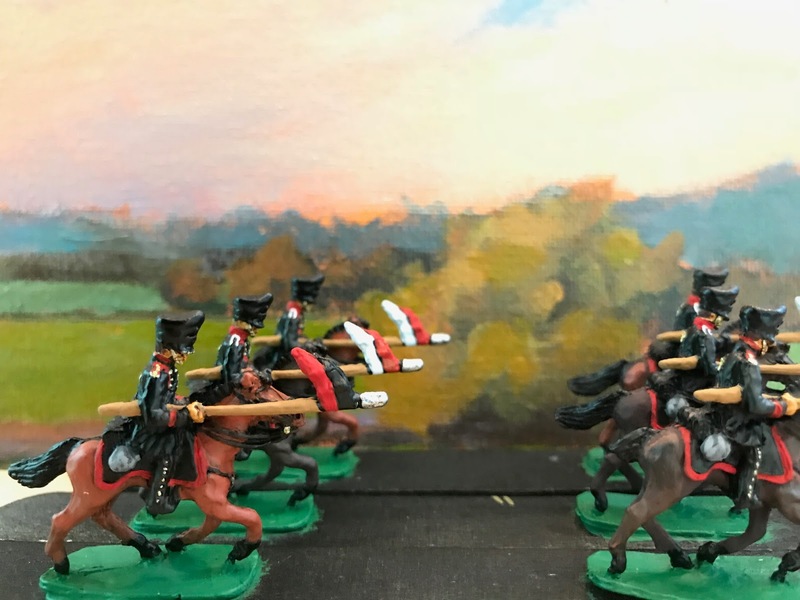 and black over red lance pennons). Note the buttons on the trousers in above plate are not visible. 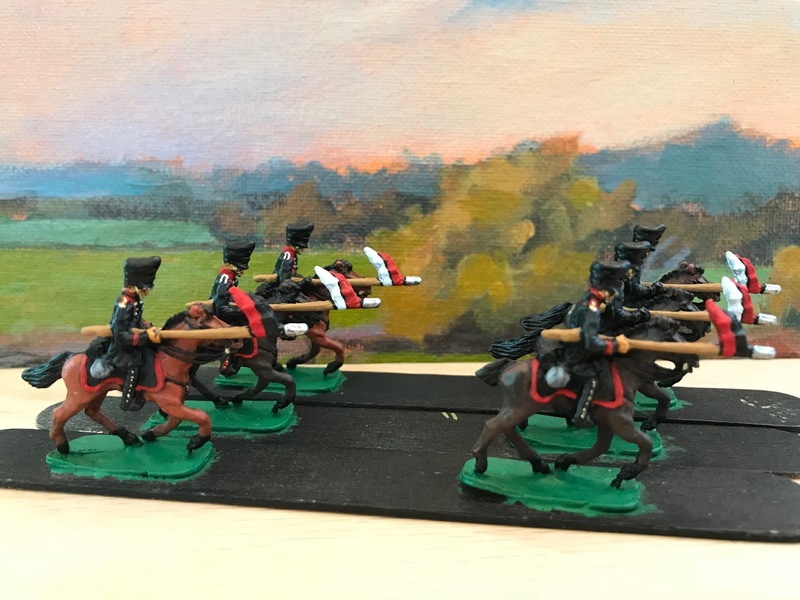 They are on the figures, so I added them. 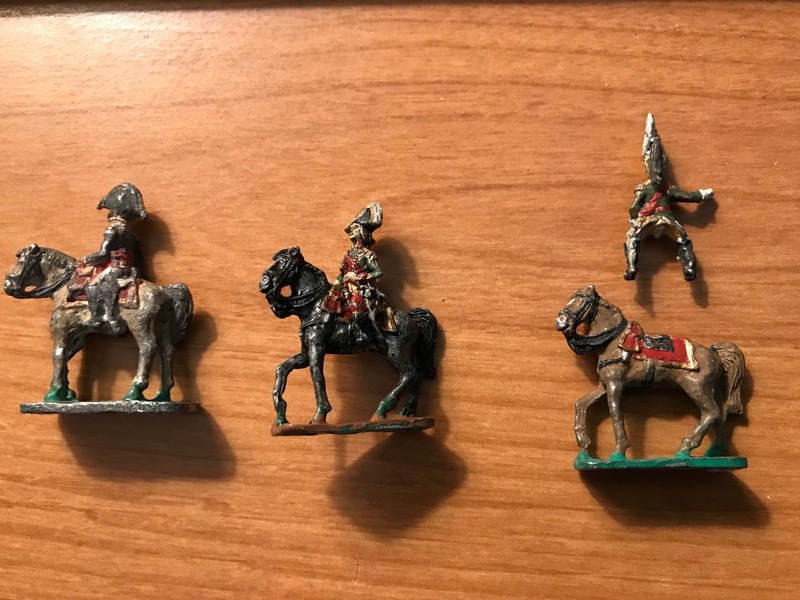 I have four remaining Prussian Lancers. 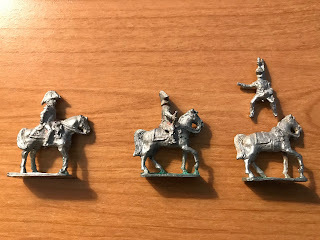 I am thinking of adding 2 more Bremen Volunteers (so that I have a complete squadron of them, and then adding 4 more Lutzow's Freikorps troopers so that I have a squadron of them as well, and then combining them into a regiment. 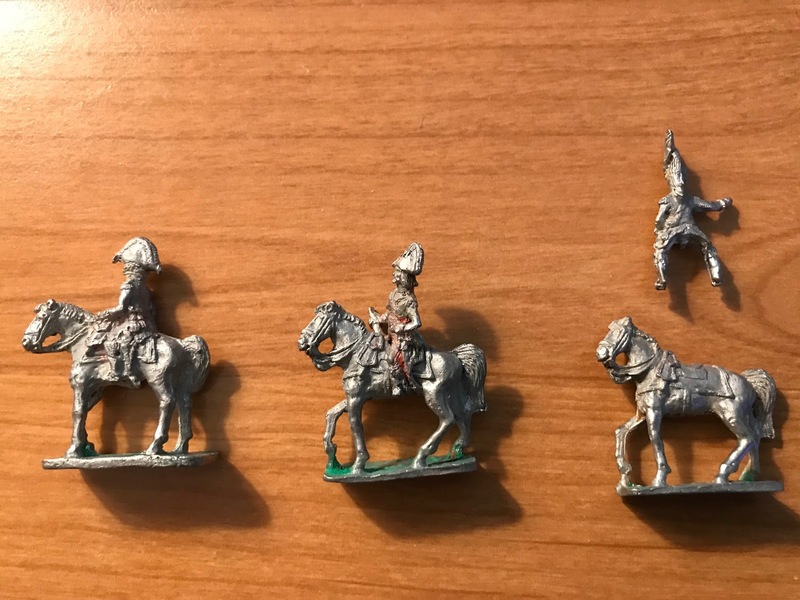 Now I will have to find two more Prussian Lancers to complete that plan. 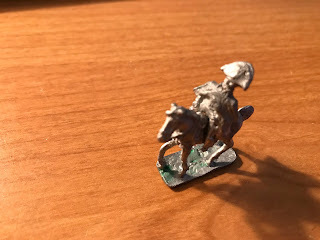 There is always something to do. 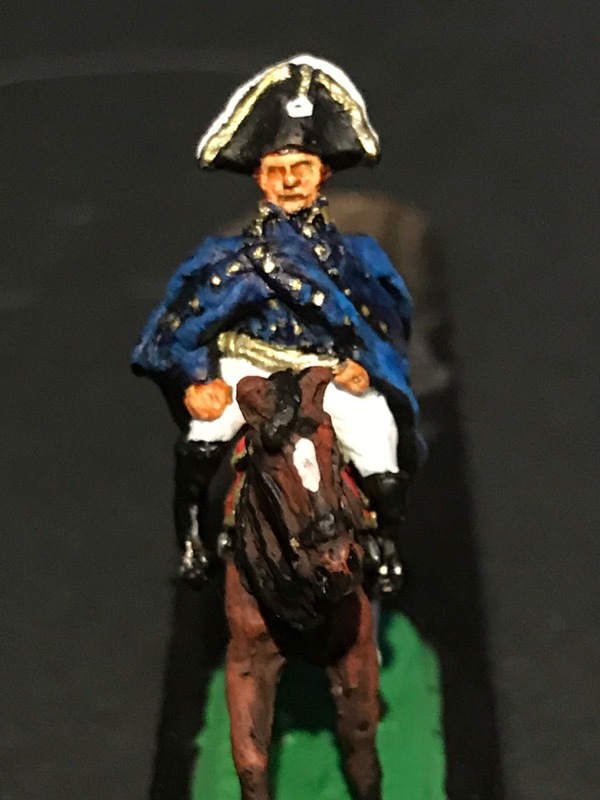 Marshal Ney has reported to camp in his new uniform and mount. 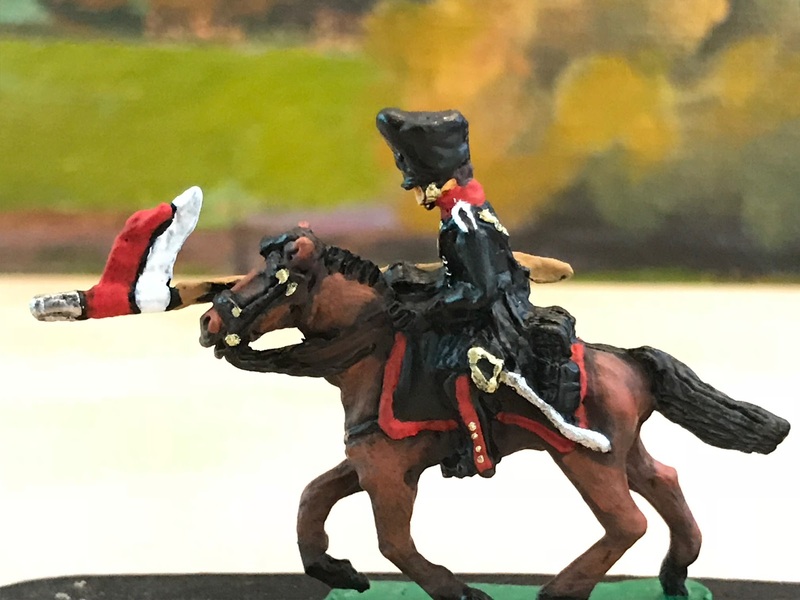 Because he is the highest ranking soldier in camp, he has been named the new camp commander. The Marshal's uniform and horse is based upon the uniform and horse shown above in the painting of by Jan van Chelminski (1851 - 1925). For additional "before" photos, to see what the figure looked like before it was stripped of paint and varnish and then primed and repainted, see this blog post. 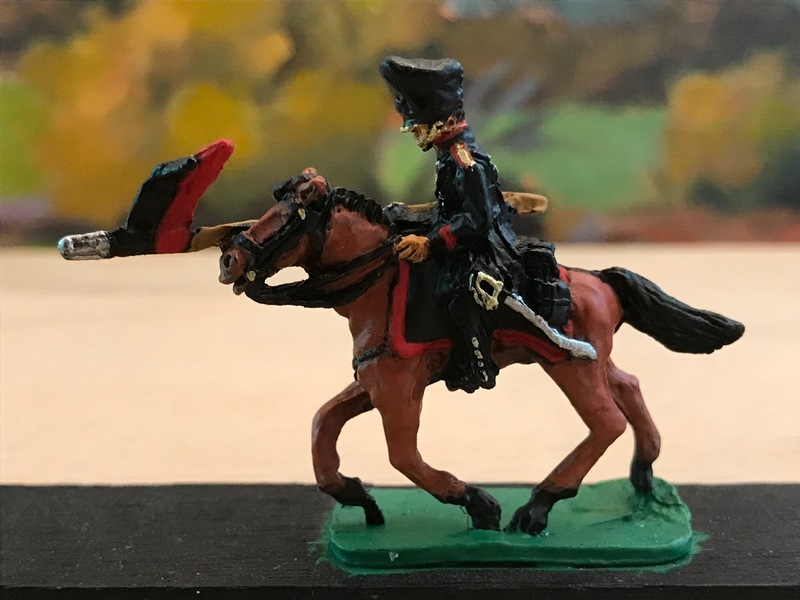 Note: "The Bravest of the Brave" still needs his coat of varnish (to withstand even the coldest of Russian winters). 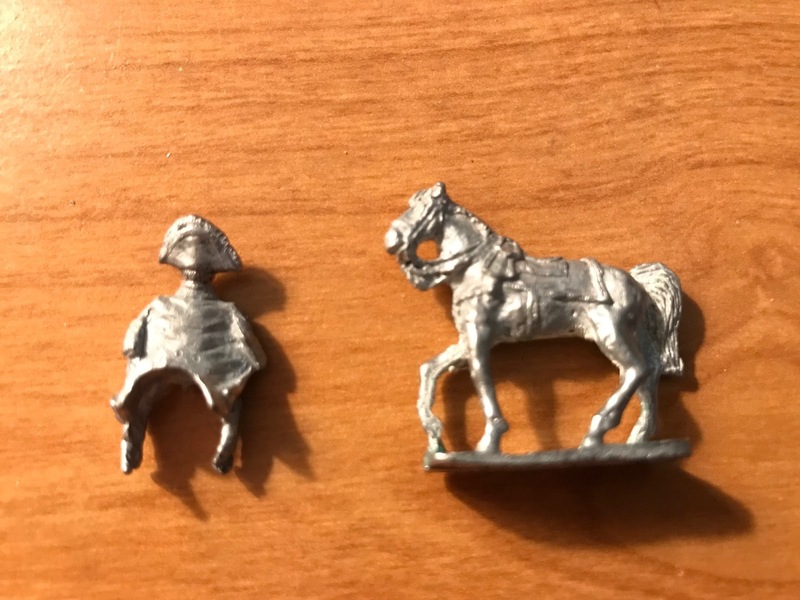 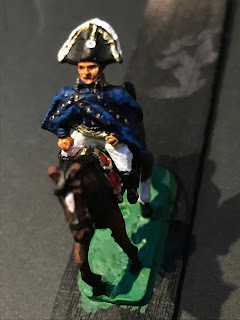 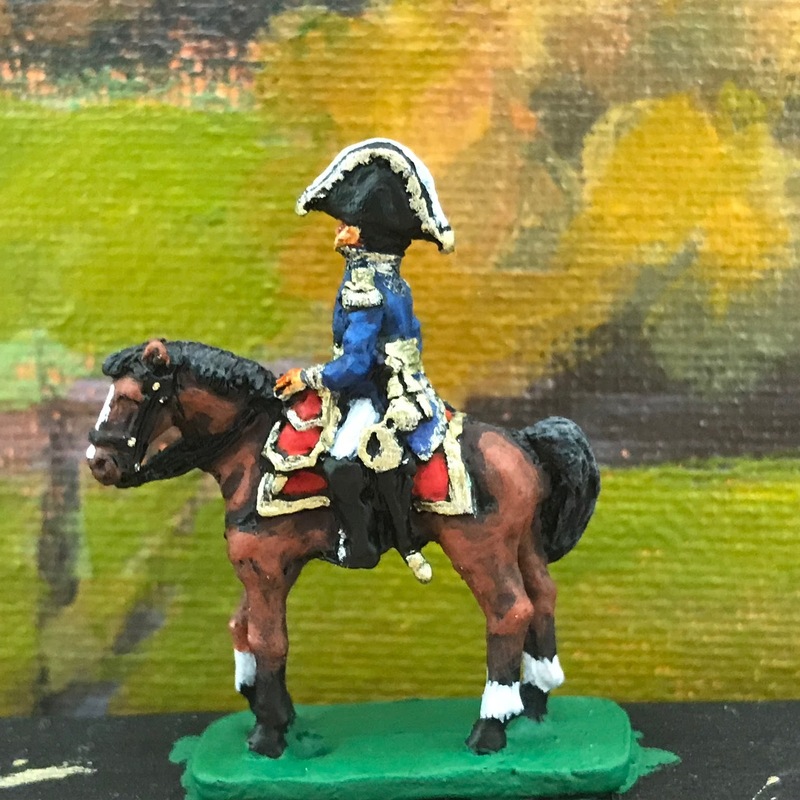 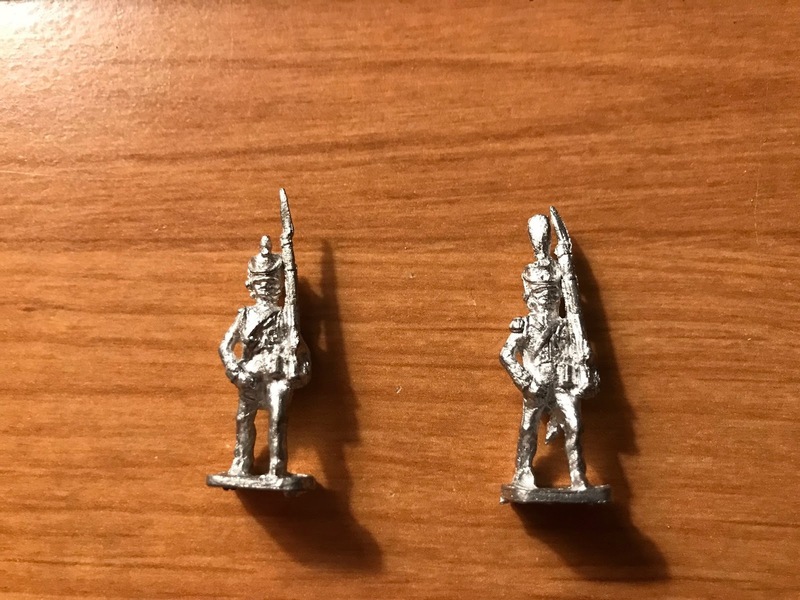 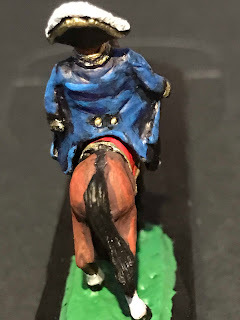 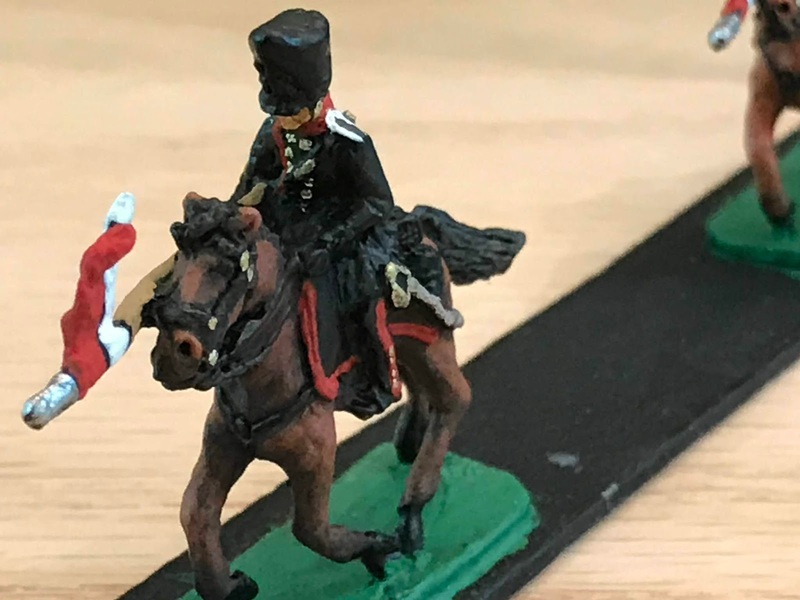 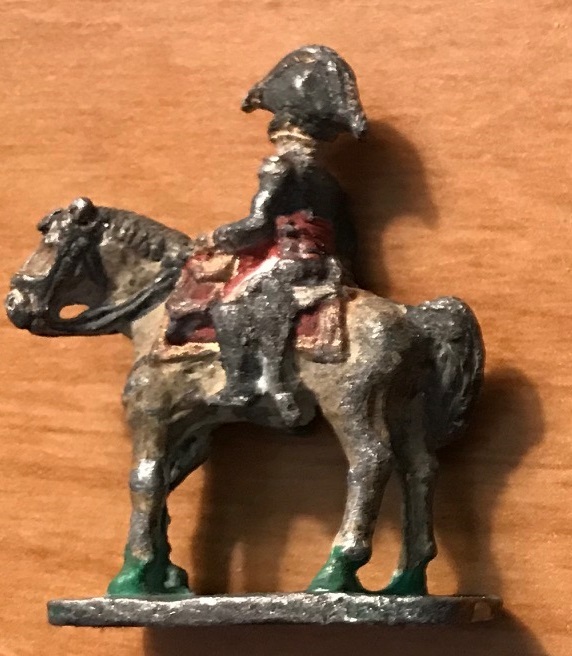 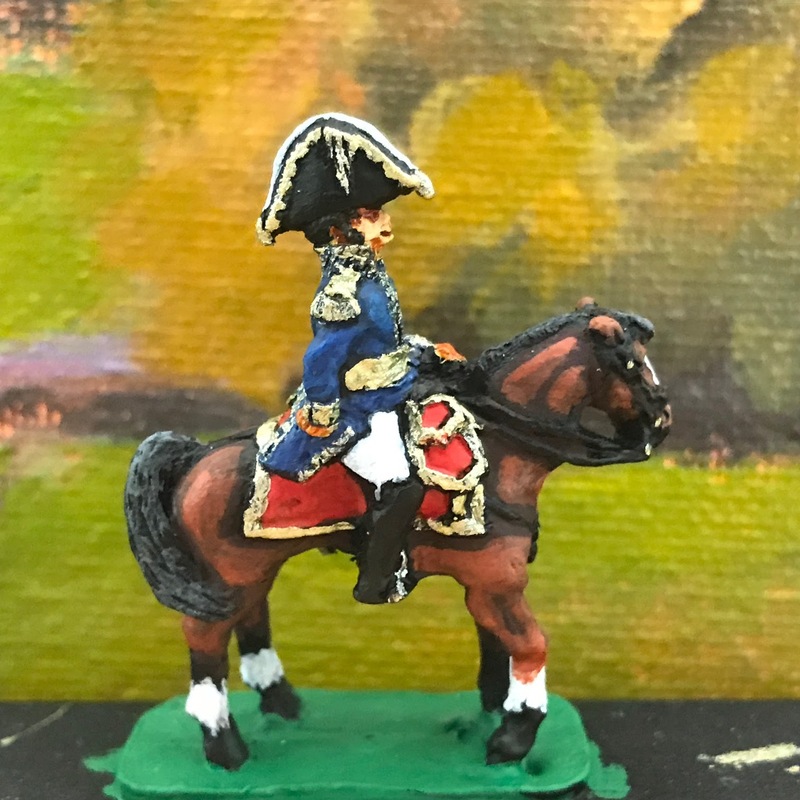 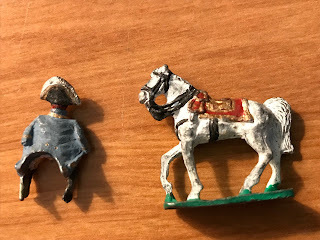 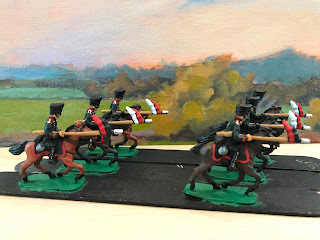 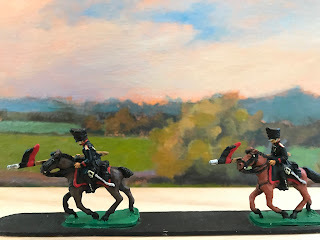 The consensus of the commenters to this blog are that the figures pictured below are Marshal Bessieres, General Baraguay d'Hilliers in Dragoon Uniform, and a standard French General. 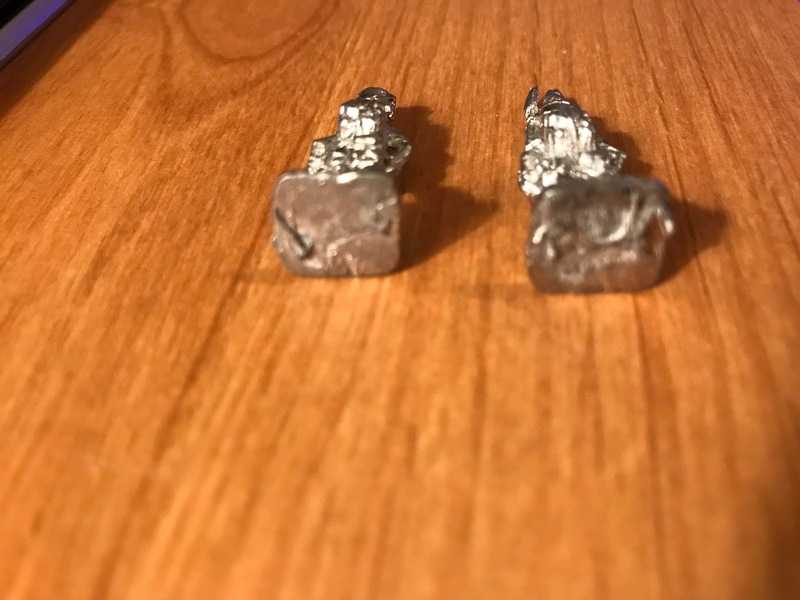 I am very pleased with how these turned out as well. Though there is a bit of paint residue that was not removed, it does not appear that it will obscure any detail after priming and repainting. 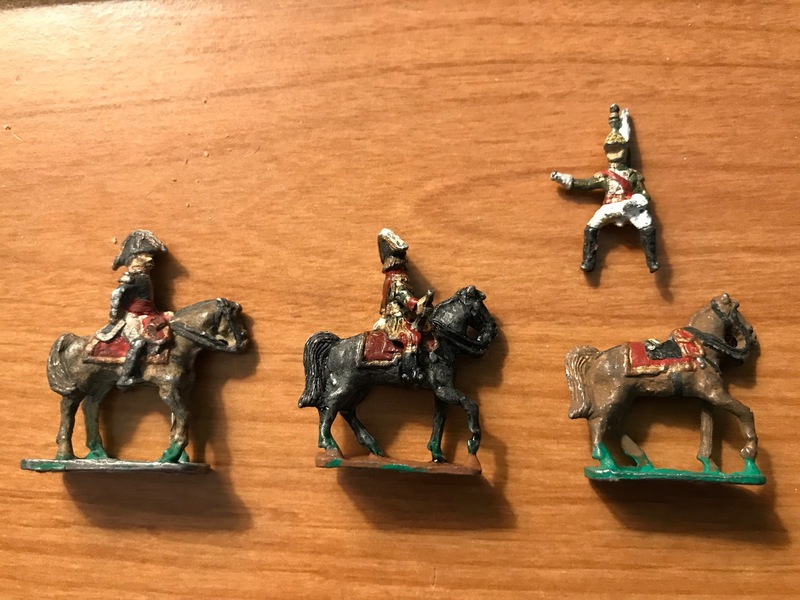 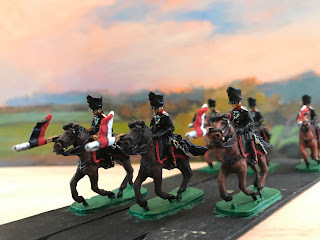 Now that these have been "refurbished" I need to get back to the 6th Uhlans and Marshal Ney. I ordered some 3M "Safest Stripper" (an Eco-friendly paint and varnish remover, safe for indoor use and no evil fumes) from the internet, and was somewhat disappointed to learn upon arrival that what I ordered was a "semi-paste." 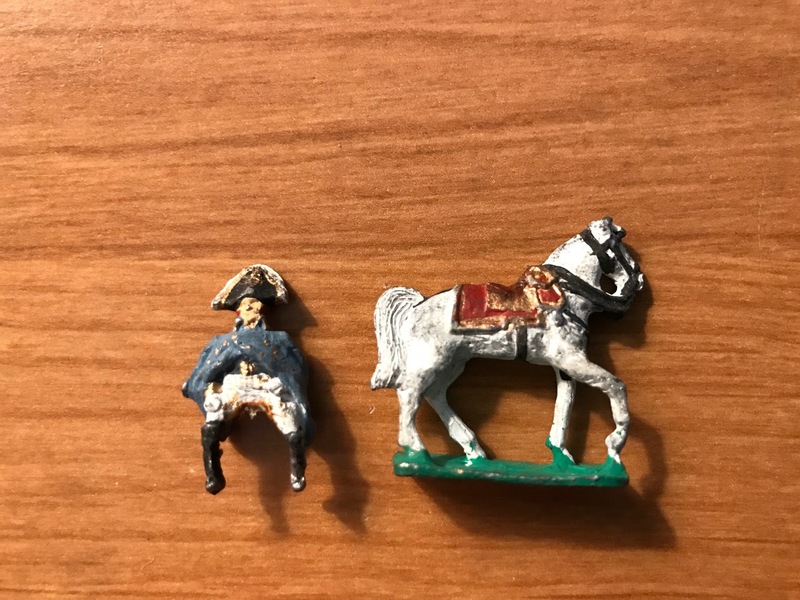 Nonetheless, I was determined to give Marshal Ney a bath and remove his old uniform, so I put enough in a jar to cover the figure and left him overnight. 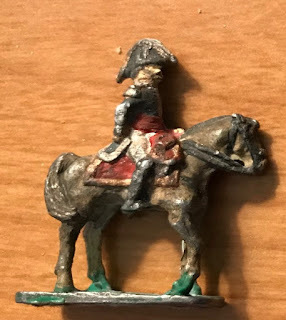 The next day, I fished him out of the paste and used an old toothbrush to scrub the figure. Traces of his uniform remained, so back in the jar went the Bravest of the Brave, and the next morning I gave him the toothbrush treatment again and below are the results. 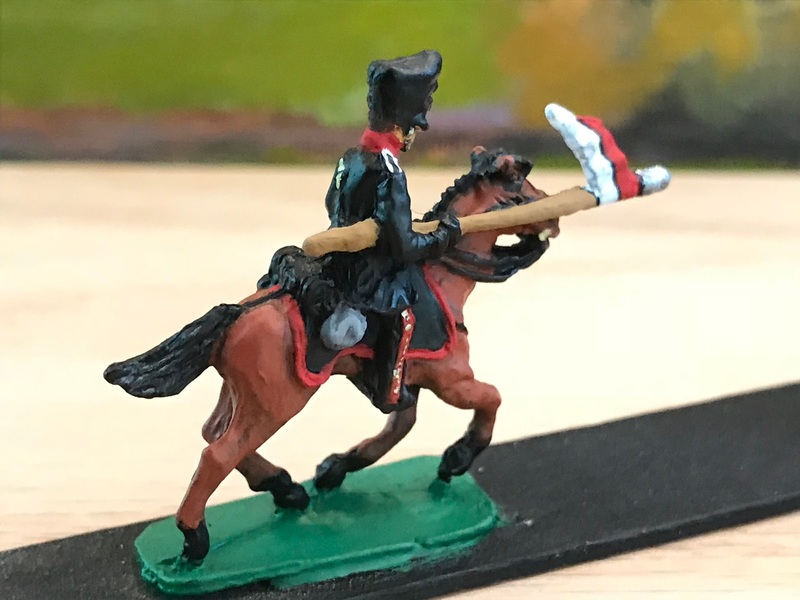 First, photos of the dusty and battered uniformed figure, fresh off the retreat from Moscow, and then the bathed and refreshed Marshal of the Empire, ready for a new uniform and the challenge of the Hundred Days. 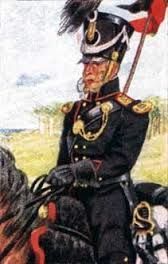 The mounted Marshal in his old uniform (before). 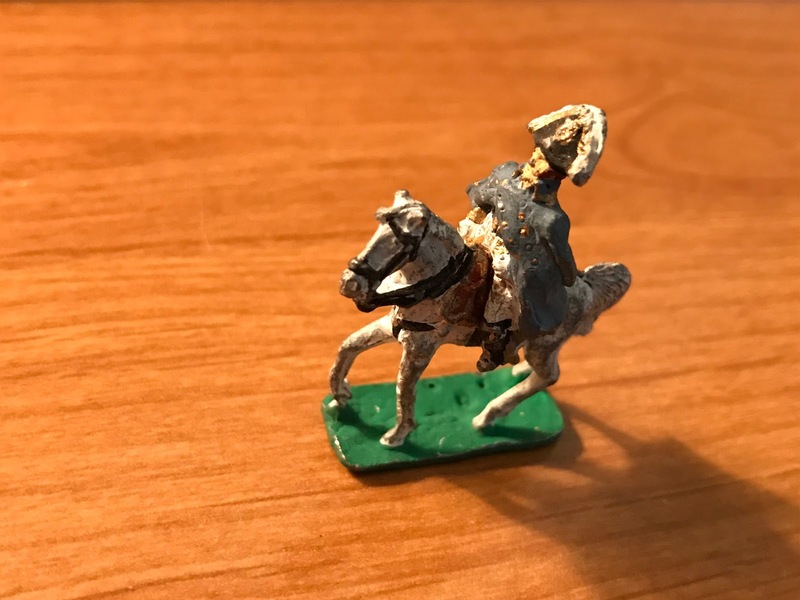 The mounted Marshal after his bath (after). 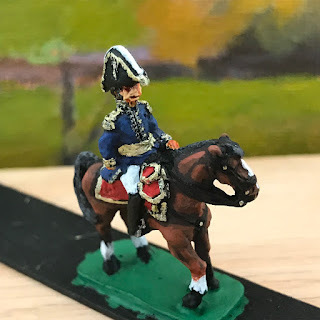 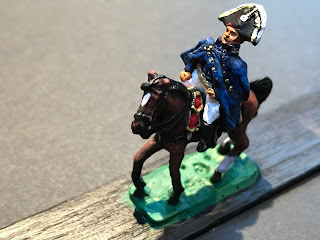 He is now in line for a new uniform and a fresh mount after the Prussian 6th Uhlans (though, being a Marshal, he will get his primer coat this evening. Rank has some privileges). 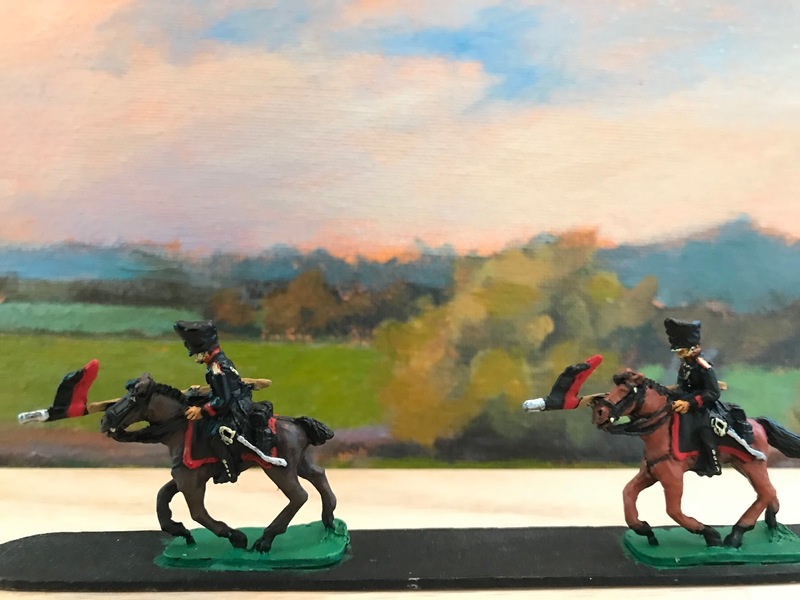 We are starting to build up a log-jam on the painting bench. O.K., time to get busy and paint! 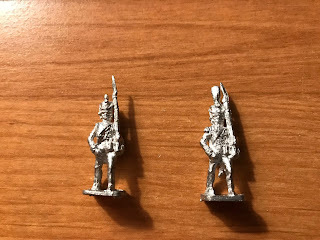 Two Mystery French Soldiers - Who are they? 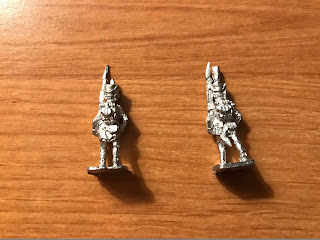 There are no markings on the bottom of the bases and it does not appear that they have been filed. Your ideas are most welcome. 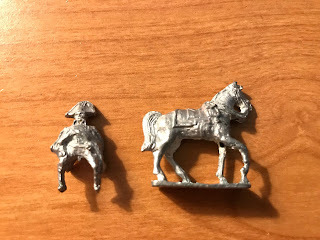 Thank you all for your help.